The term Russian diaspora refers to the global community of ethnic Russians. The largest number of Russians living outside Russia can be found in former republics of the Soviet Union ;Russian-speaking populations also exist in the USA, in the European Union and in Israel . 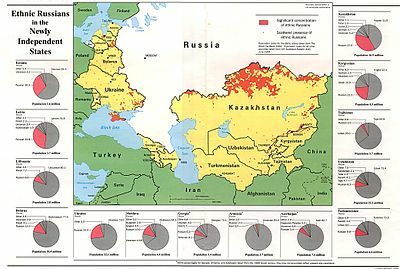 According to Russian government data, there are almost ten million Russians in Central Asian countries (over half of them in Kazakhstan see Russians in Kazakhstan), 11 million in Ukraine (see Russians in Ukraine), about one million in the independent republics of the Caucasus, 1.3 million in Belarus , 200,000 in Moldova , and a million and a half in the three Baltic states that were formerly part of the Soviet Union (800,000 in Latvia , 330,000 in Estonia and 340,000 in Lithuania ). The rest of the European Union is home to roughly 200,000 Russian speakers; as many as 850,000 live in the United States . Many Russians also live in the United Kingdom (300,000), Canada (158,850), Brazil (70,000), Chile (70,000), and Argentina (50,000), as well as Australia and New Zealand (20,000). Russians are officially one of the 56 ethnic minorities in China , many Russians live in Mongolia , although some left the country following the withdrawal of economic aid and collapse of the Soviet Union in 1991. The term Russian diaspora refers to the global community of ethnic Russians, usually more specifically those who maintain some kind of connection, even if ephemeral, to the land of their ancestors and maintain their feeling of Russian national identity within a local community. The term "Russian speaking (Russophone) diaspora" (русскоговорящая диаспора) is used to describe people for whom Russian language is the native language regardless whether they are ethnic Russians or Ukrainian , Tatars, Jews, Chechens etc. The earliest significant wave of ethnic Russian emigration took place in the wake of the Old Believer schism in the 17th century (see, for example, Lipovans). On some occasions later ethnic Russian communities, such as Doukhobors, also emigrated as religious dissidents fleeing the central authority. A sizable "wave" of ethnic Russians emigrated during a short time period in the wake of the October Revolution and Civil War, known collectively as the White emigres. It is also referred to as the "first wave", even though previous emigrations took place, as it is the first wave to have come in the wake of the communist revolution and it carried on a heavily political character. A smaller group of Russians (often referred to by Russians as the Second wave of Russian emigration had also left during World War II, they were refugees, eastern workers, or surviving veterans of the Russian Liberation Army and other anti-communist armed units who had served under the German command and evaded forced repatriation. In the immediate post-World War II period, the largest Russian communities in the emigration were to be found in Germany , Canada , the U.S. , United Kingdom and Australia. In the 1970's a number of Russian-speaking Soviet citizens (predominantly Jews) emigrated to Israel and the U.S. due to political and economic reasons, and also to escape antisemitism. Some Soviet dissidents were forced to emigrate by KGB which threatened them with arrest. This group is often called The Third wave of Russian emigration. Immediately before and after the collapse of the Soviet Union, significant emigration of citizens of the Russian Federation to various parts of the world has taken place, mostly for economic reasons. Israel and Germany have received the largest shares of Russian speaking immigrants (Israel - predominantly Jews, Germany - predominantly ethnic Germans and Jews) in the nineties, because of incentives institutionalized by the governments of both countries. It should be also noted that before and during the Soviet period ethnic Russians migrated from Russia proper throughout the area of the former Russian Empire and the Soviet Union , sometimes encouraged to re-settle in borderlands by Tsarist and later Soviet government. That is why after the Baltic states regained independence and after the dissolution of the USSR many ethnic Russians found themselves in the independent states other than Russia. As noted above, they represent the largest number of ethnic Russians living outside Russia. Today largest ethnic Russian diasporas outside of Russia live in former Soviet states such as Ukraine (about 8 million), Kazakhstan (about 4.5 million), Belarus (about 1.2 million), Latvia (about 700,000), Uzbekistan (about 650, 000) and Kyrgyzstan (about 600,000). There are also small Russian communities in the Balkans, Eastern and Central European nations such as Germany , as well as in China and Latin America. These communities may identify themselves either as Russians or citizens of these countries, or both, to varying degrees. The governments and the majority public opinion in Estonia and Latvia , which has the largest share of ethnic Russians among the Baltic countries, hold the view that many of the ethnic Russians arrived in these countries as part of a Soviet-era colonization and deliberate Russification by changing the countries' ethnic balance. Among the many Russians who arrived during the Soviet era most came there for economic reasons, or in some cases, because they were ordered to move. People who had arrived in Latvia and Estonia during the Soviet era, mostly Russians, were only provided with an option to acquire naturalised citizenship which required passing a test demonstrating knowledge of the national language as well as knowledge of the country's history and customs. The language issue is still contentious, particularly in Latvia, where ethnic Russians have protested against plans to educate them in the official language instead of Russian. Since 1992, Estonia has naturalized some 137,000 residents of undefined citizenship. 118,800 person (mainly ethnic Russians) or 8.7 per cent of the total population, are of undetermined citizenship. In Latvia, non-citizens are approximately 415 000 or 17 % of the population. According to a report by Amnesty International, there are "disproportionately high levels of unemployment among the Russian-speaking linguistic minority" in Estonia. "This in turn has further contributed to social exclusion and vulnerability to other human rights abuses. In consequence, many from this group are effectively impeded from the full enjoyment of their economic, social and cultural rights". Both the European Union and the Council of Europe, as well as the Russian government, expressed their concern during the 1990s about minority rights in several countries, most notably Latvia . In Moldova , the Russian-dominated Transnistria region broke away from government control amid fears the country would soon reunite with Romania . In June 2006 Russian President Vladimir Putin announced the plan to introduce national policy aiming at encouraging ethnic Russian immigration to Russia. In Estonia , Nochnoy Dozor is a political pressure group made up mainly of ethnic Russians non-citizens living in Estonia . The group was set up in the summer of 2006 to rally against the removal of the monument to the Bronze Soldier of Tallinn from the heart of the Estonian capital, Tallinn . Russians are one of the 56 ethnic groups officially recognized by the People's Republic of China . There are approximately 15,600, living mostly in northern Xinjiang, and also in Inner Mongolia and Heilongjiang . In the 1920s Harbin was flooded with 100,000 to 200,000 Russian White émigrés fleeing from Russia. Some Harbin Russians moved to other cities such as Shanghai, Beijing, Tianjin . By the 1930s, Shanghai's Russian community had grown to more than 25,000. There are also smaller numbers of Russians in Japan and Russians in Korea. The Japanese government dispute Russia's claim to the Kuril Islands , which were annexed by the USSR in 1945 after Japan's surrender in World War II. The Red Army expelled all Japanese from the island chain, which was resettled by Russians and other Soviet nationalities. A few Russians also settled in the Korean peninsula in the late 19th and early 20th centuries. The population of Russians in Singapore was estimated at no more than a thousand by the local Russian embassy in 2008; they are a largely professional and business-oriented expatriate community, and count among their numbers more than a hundred company owners or local heads of branches of large Russian multinationals. Russian settlement settlement in Mexico was minimal but well documented in the 19th and early 20th centuries. A breakaway sect of Old Believers of the Russian Orthodox Church, the Molokans arrived in Baja California the state facing California , USA in the 1880s-1920s to escape persecution from Tsarist Russia. The Molokans received a land grant in the Guadalupe Valley south of Ensenada to establish a few villages and held onto a Russian culture for a few decades before they were abandoned and cemeteries bearing Cyrillic letters remain. Dissenters of the official Soviet Communist party like the Trotskyites along with leader Leon Trotsky found refuge in Mexico in the 1920s, where he was assassinated by Soviet agents in 1940. Embajada de la Federación de Rusia en la República de Chile. Los primeros rusos en Chile. Robert Greenall, Russians left behind in Central Asia, BBC News, 23 November 2005. Russia Abroad: A comprehensive guide to Russian Emigration after 1917 Biographical databases. Photoarchive. Research results accompanied by original documents, paper extracts.